This Scottish based Saxophone Quartet provides the perfect compliment to any occasion. This ensemble enriches the atmosphere with the seductive sound of four saxophones. 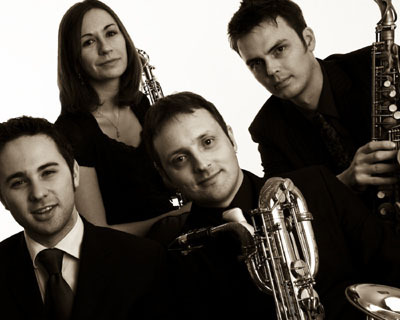 This Scottish based Saxophone Quartet provides theperfect compliment to any occasion. Playing acoustically, this ensemble enriches the atmosphere with the seductive sound of four saxophones.The ensemble offers a number of line up options which includes a duo, with other options available on request. Both large and small ensembles are perfect for any occasion to give your event that special touch. De Quorum have performed all over the country at weddings and corporate events for an extensive client list including the British Grand Prix.